Achtung! Sie betrachten gerade Informationen der Data Driven Business Berlin 2016! Zur Aktuellen Seite zurückkehren. Saim Alkan ist Geschäftsführer von AX Semantics - einem der Vorreiter im Bereich automatisierte Texterstellung. Auf der Basis seiner langjährigen Erfahrungen mit Anforderungen an Content-Herstellung und -Qualität sowie der Umsetzung effizienter Publikationsprozesse entwickelte Saim Alkan mit AX Semantics eine Lösung, die aus Daten hochwertige Texte derzeit in 13 Sprachen für den Einsatz im E-Commerce und in den Medien generiert. Saim Alkan ist als Dozent und Referent für im Bereich Online-Kommunikation und “Roboterjournalismus” tätig. Daneben hat er mehrere Fachbücher über Texten im Internet und Organisation von Online-Redaktionen veröffentlicht. As Director Digital Marketing Strategy EMEA, Harald Behnke leads product development, marketing and sales initiatives for the Oracle Marketing Cloud. He previously supported the company's cloud transformation in leadership roles from Product Management, Marketing to Media Industry Solutions. Prior to joining Oracle, Harald Behnke was CEO and co-founder of the digital startups ExitGames.com and Radio.net. Mr. Behnke started his career as Managing Director at digital marketing agency Pixelpark (Publicis group). He holds degrees in Computer Science (HFU) and Business Administration (HSBA). Sagiev Busch ist Gründer und Geschäftsführer von Peaks & Pies, einer Boutique für Conversion Optimierung, Webanalyse und BI. Nach verschiedenen Stationen bei Online-Agenturen arbeitet er seit 2008 als Consultant für Conversion Optimierung und hat seit dem vielleicht mehr Tests operativ umgesetzt als jeder andere in Deutschland. Durch seinen technischen Hintergrund (Studium Medieninformatik) schreckt er auch vor komplexeren Testsetups nicht zurück. Jonathan Epstein is chief marketing officer of Sentient Technologies, the best-funded independent artificial intelligence company. In that role, he oversees all marketing strategy and execution for Sentient's two Intelligent Commerce products: Sentient Ascend, the AI-powered CRO solution which has ushered in the era of massively multivariate testing, and Sentient Aware, which uses AI to create product-driven customer experiences for the world's leading retailers. Epstein has started, managed, and monetized numerous technology and media companies, including GameSpot (founding CEO), GameSpy (president), IGN (EVP), Omek Interactive (President), and Hawkes Remotes (CEO.) He holds a degree in physical sciences from Harvard, three patents, and is an accomplished bassoonist. Mobile-Desktop-Tablet - Wie man mit Google Analytics Nutzer über verschiedene Gerätekategorien hinweg identifiziert und besser versteht. Liad Goldsmith (B.Des) is the owner of GUX™ studio based in Tel-Aviv, Israel and is an expert UI/UX designer for mobile, desktop and web. Some of Liad's clients are companies and startups such as: Citibank’s Innovation Lab, Teoco, Weizmann Institute of Science and more. Before establishing GUX™ studio, Liad was a creative team member at the award-winning Soluto (Techcrunch Disrupt contest). Day to day, you will also find Liad accompanying entrepreneurs in their work process and lecturing in start-up hubs and accelerators on how to create winning UI/UX for products. In the past few years, Liad worked with hundreds of developers, dozens of start-ups and her product designs have reached over 2 million users worldwide. She also wrote the first guide for designers and developers working alongside. Ben Harmanus baut seit März 2015 als Head of Community & Content Marketing die Präsenz des kanadischen Marketing/-Design-Tool-Anbieters Unbounce im deutschsprachigen Raum aus. Sein starker Fokus auf Nutzerverhalten führte ihn 2009 nach Berlin, um für die Marktforschungsagentur I+E BERLIN den Bereich “Konsumentenstudien und Trendcasting” neu zu strukturieren. Der Schritt zum datengetriebenem Content Marketing erfolgte 2014 in seiner Tätigkeit als Marketingleiter für Crispy Content, einer Content-Marketing-Agentur mit Kunden wie Viacom oder Red Bull. A well known analyst and consultant in the analytics and digital marketing space. Author of 2 books (Cult of Analytics - Elsevier 2009 & The Sucking Manifesto (release in summer 2013) Steve has saved or made his clients hundreds of millions of Euros since he started working in the space in the middle of the dot bomb era. Currently focusing on improving digital marketing and analytics activities across his client base (now numbering about 50 clients including Nokia, Rovio, Marimekko, KONE to name a few). Also responsible for developing the internal competence of the analytics, testing and digital marketing teams in Quru. In his spare time he can often be found fishing or pulling out his hair watching SAFC. Justine is director of marketing at Litmus, a Boston-based SaaS company that lets you preview and test your emails before you send. A recovering designer, she now leads community, content and education initiatives—publishing original research and organizing the world's only conference for email designers. Prior to joining Litmus, Justine led the creative services team at ExactTarget and was responsible for designing, building and managing email campaigns for SMB through Fortune 500 customers. She’s strangely passionate about this email marketing thing, hates being called a spammer, and still gets nervous when it's time to hit the send button. Dr. Alexander Korth ist Leiter von Webmetrics, einer Unternehmensberatung für Marketing Technologie und Digitalisierung. Webmetrics ist Teil der Publicis Media und unterstützt Advertiser bei Strategie, Auswahl, Integration und Betrieb von Tools wie Web Analyse, Testing, Personalisierung, DMPs und Dashboarding. Dr. Korth ist außerdem Director Digital Technology bei Publicis Media und war zuvor bei United Internet Media für das Portfolio der Daten-getriebenen Targeting- und Insights-Produkte verantwortlich. Er ist auf künstliche Intelligenz spezialisierter Diplom Informatiker und hat über Privatsphäre in Social Networks promoviert. 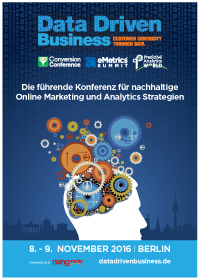 Conversion Optimierung ist tot - lang lebe Conversion Optimierung! Inhaber DIGITALTRANSFER und Vermarktungsexperte mit mehr als 25 Jahren Erfahrung auf Unternehmensseite (ELIXIA, IKEA) und Agenturseite (Ogilvy & Mather, Wunderman, Pepper, mds) mit Schwerpunkt auf mittelständischen Unternehmen im B2B-Bereich. Führungskräfte-Coach (DBVC zertifiziert), Lehrbeauftragter für Strategie und Umsetzung moderner Markenführung an der Hochschule für angewandtes Management und Berater der „Initiative Mittelstand“. Diplom-Kaufmann (Friedrich-Alexander-Universität Erlangen-Nürnberg), Wahl-Münchner und begeisterter Segler. Thomas Otzasek ist Head of Data Science bei Whoop!, einer von Smarter Ecommerce entwickelten Bid-Management-Software für Google Shopping. Als Experte für Business Intelligence, Machine Learning, Visualisierung und Analysen hat er den vollautomatisierten Algorithmus hinter Whoop! entwickelt. Er verfügt über Studienabschlüsse in Statistik und Bioinformatik, hat zwei Bücher veröffentlicht und bloggt regelmäßig über Google Shopping und Data Science. Seit 2009 ist er Lektor an der Johannes Kepler Universität, wo er seinen Studenten die Welt der Statistik vermittelt. Shyamala Prayaga is a user experience evangelist and interaction designer with 14 years’ experience in mobile and web enterprise applications. A civil engineer by education, Shyamala turned her passion for making things better for users into an accomplished career as a UX designer. When she's not designing next generation products for Amazon associates, publishers and sellers, Shyamala can often be found ranting about bad designs or sharing ideas with other UX designers about how to improve user experiences. Talia teaches businesses how to plan and execute conversion optimization programs. She runs thousands of AB tests using emotional targeting and consumer psychology to help grow and scale their business. Anisa Boumrifak schrieb 1997 ihre erste Zeile HTML und ist seit dem der digitalen Welt treu geblieben. Nach verschiedenen Stationen im Web Development und im Marketing auf Agentur und Industrie-Seite, ist sie seit 2007 hauptberuflich als Web Analystin tätig. Seit 2011 berät und unterstützt sie als Geschäftsführerin und VP Analytics für M8 performance namhafte Unternehmen bei Projekten und Aufgaben im Digital Analytics-Umfeld. After 4.5 years leading mobile growth efforts at SoundCloud, Andy now consults a variety of startups and SMEs through the mobile growth consultancy Phiture, co-founded with fellow ex-SoundClouder Moritz Daan. In 2014, Andy published the Mobile Growth Stack, a strategic framework which has been widely adopted within the industry as a key tool for growth marketers, CMOs and strategists. Andy put the stack into action at SoundCloud, applying the framework to tackle the audio platform's mobile growth challenges. With the Phiture mobile growth consultancy, Andy now helps companies across the globe to develop sustainable growth strategies and tactics. Prior to joining SoundCloud, Andy developed and published mobile games, including the original ‘Space Impact’ game, embedded on over 150 million handsets worldwide. Andy has over 13 years of mobile experience: developing mobile software, launching mobile services and delivering B2B mobile solutions. Justin is a consultant, author, and the Analytics Evangelist for Google. Some of Justin's former clients include Toyota, Sony Music, Universal Music, the National Hockey League, Wells Fargo, and HomeAway. In his current role at Google, Justin leads the analytics education team. This team creates various learning experiences, like the Google Analytics Help Center and Analytics Academy, Google's massive, online analytics course. He publishes the blog Analytics Talk and has authored or co-authored three books: Google Analytics (O'Reilly, 2007), Performance Marketing with Google Analytics (Wiley 2010) and Google Analytics, 2nd Ed. (O'Reilly, 2010). His next edition of Google Analytics is scheduled to be published in March 2015. In recognition of his outstanding role in the analytics community, Justin was voted Most Influential Industry Contributor by the Digital Analytics Association in 2014. Moritz helps companies with apps grow with his consultancy firm Phiture.com. Previously he founded and sold two online browser-based gaming companies. After that, he worked at SoundCloud for 2 years on ASO, viral loops, cross-selling and international related themes as Growth PM. Mira arbeitet aktuell bei Zalando und ist seit 4 Jahren Web Analyst. 2012 hat sie bei CosmosDirekt ihre Masterarbeit zum Thema Campaign Measurement geschrieben und zwei Jahre dort unter anderem am website relaunch projekt mitgearbeitet. Danach hat sie für Bluetrade in Köln Web Analytics Consulting und Support für internationale Kunden gemacht. Als Manager Onsite intelligence kümmert sie sich bei Zalando unter anderem um die Reporting und Analysetrategie der Brand Kampagnen. Benjamin started his career within Allianz Germany Operations Controlling as a number cruncher with a soft spot for new patterns in comprehensive business data sources. In 2013 Benjamin joined Allianz Managed Operations & Services (AMOS) as first dedicated Analytics consultant and supported the creation of the Digital Analytics department orchestrating the global rollout of BI & Analytics solutions for the Allianz Group. In his current position he promotes Allianz Digitalization Strategy by gradual enhancement of AMOS’ BI & Analytics shared service portfolio in particular leading AMOS Fraud Analytics Program. Informationen zur Session mit Benjamin Erhard folgen in Kürze. Als CTO des Inkubators TruVenturo unterstützt André Kolell die IT-Teams aufstrebender Start-ups im Aufbau ihrer Systeme und Prozesse. Von 2013 bis 2016 hat er in der Rolle des CTO FINANZCHECK.de auf technischer Seite vom kleinen PKV-Vermittler zu einem der größten Kreditvergleiche Deutschlands umstrukturiert. Zuvor hat er BWL und Informatik in Hamburg, Kiel und Sydney studiert, im OTTO Konzern gearbeitet und die IT der Online Marketing Agentur Blue Summit Media aufgebaut. Seine große Leidenschaft sind neue Geschäftsmodelle und Technologien, die das Potential großartiger Veränderungen mit sich bringen. Alexander has more than 5 years of experience in analytics for the digital industry coming with a very strong technical background of developing in Java and Objective C. Having a master diploma in high mathematics and statistics helps him to drift across programming-analytical disciplinary to bring the most value from both sides. In his portfolio Alexander has such companies as Kaspersky, McCann and Sixt as a current working place. He is advanced in R language and have a significant experience with Hadoop. Alexander is a fan of Hadoop and very passionate about big data area. Bernhard Rathmayr ist seit über 15 Jahren in verschiedenen Bereichen des Online-Business tätig. Daten-basierte Analysen des User-Verhaltens zählen dabei von Anfang an zu Rathmayrs Haupt-Themen. Seit 2008 hat der gelernte Sozialwissenschaftler bei T-Mobile Austria unterschiedliche Funktionen im e-Commerce und e-Service bekleidet. Darunter fällt auch die Implementierung von daten-basiertem Programmatic Marketing. Christian Schlieker works as VP of Analytics for Digital Performance, where he is responsible for all aspects of digital analytics of Performance Marketing and Marketing Technology. Digital Performance is a dedicated and fast-growing Internet company based in Berlin, focusing on building sophisticated marketing machines in online entertainment. Prior Christian worked several years at eBay where he honed his skills in the fields of Pricing and Customer Analytics. Having a background in SEO and statistics Christian feels comfortable in the friction fields between hard data science and operational execution of digital marketing. Methoden. Seit seinem Studium der Wirtschaftsinformatik an der FH Wedel und der Université de Fribourg (CH) ist Andreas Stuht seit nahezu 10 Jahren im Umfeld der digitalen Analyse tätig. Tim has been working with digital data full-time since 2001 in a variety of roles: from managing a web analytics platform migration and developing analytics processes as the head of the business intelligence department at a $500 million high tech B2B company; to creating and growing the analytics practices at three different agencies that worked with a range of large consumer brands; to consulting with the digital analytics teams at Fortune 500 companies on the their strategies, processes, and tactics for effectively putting their digital data to actionable use. Tim is a long-time creator of pragmatic content for analysts and marketers, including co-hosting the bi-weekly Digital Analytics Power Hour podcast (analyticshour.io) and co-creating dartistics.com -- a site dedicated to encouraging analysts to learn the R programming language and apply statistical methods to their data. Tim is physically based in Columbus, Ohio, while his heart and soul maintain joint custody with Austin, Texas.